October 27, 2007 – Chicago Tribune architecture critic Blair Kamen begins his column with this disclosure, “Donald Trump hung up on me this week after he phoned to defend the blatantly commercial 10-foot-tall Michigan Avenue kiosk for his 92-story-hotel-condo tower.” [Chicago Tribune, October 27, 2007] A week earlier the paper’s Tempo column had run a story about the kiosk that sat on a sidewalk in front of the Wrigley Building. That stirred a fire under Forty-Second Ward Alderman Burton Natarus, who vowed to get the advertising taken from the kiosk despite the fact that it was he who had backed the legislation allowing the advertising in the first place. 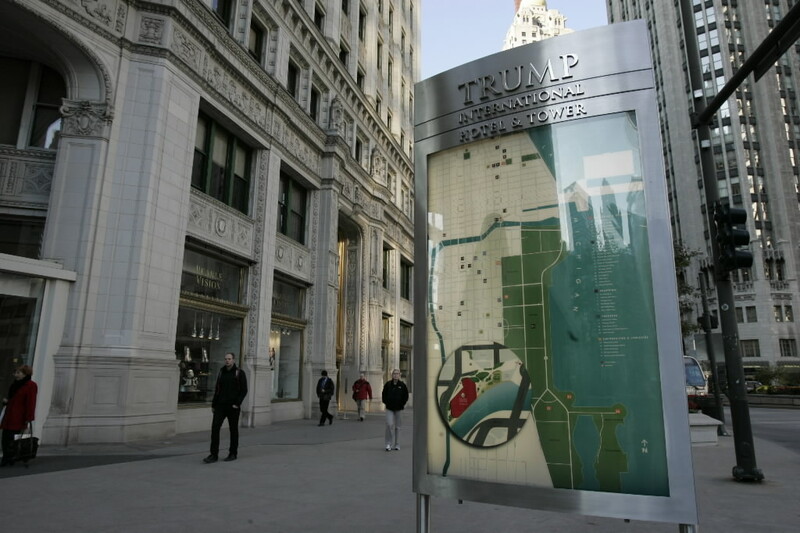 Trump, before he hung up, reminded Kamen of the fact that the glitzy kiosk was justified because he had spent $18 million to rebuild the superstructure of Wabash Avenue next to the new tower, saying, “This is a very small element of a very big commitment that I made to Chicago.” As Kamen pressed the issue, Trump ultimately responded, “Write it any way you write it. I’ve had it with you. Thanks Blair.” It would be over two years before the kiosk would come down, but finally on January 8, 2009 it was dismantled. The city won this fight against a guy who never forgets a slight. Trump would go on to place his name on one of the city’s signature buildings in letters so large that a 10-foot-tall glitzy kiosk he was told he couldn’t keep five years earlier seemed almost laughable. October 27, 1971 – The announcement is made that plans are complete for an 800-unit building that will sit on the lakefront border of the Illinois Center development being created over a former railroad freight yard. The Chicago architectural firm Solomon, Cordwell and Buenz will design the building and the developers will be the Illinois Center Corporation, a subsidiary of Illinois Central Industries, Inc. and Talman Services Corporation, a subsidiary of Talman Federal Savings & Loan Association. The residential building, today’s Harbor Point, will benefit from a city plan to reroute Lake Shore Drive so that it will curve around the building’s east side, ensuring that the tower will be more easily accessible, allowing it to stand as an architecturally significant statement on the southeast side of the Illinois Center development. Harbor Point stands next to the lake to the left in this photo. 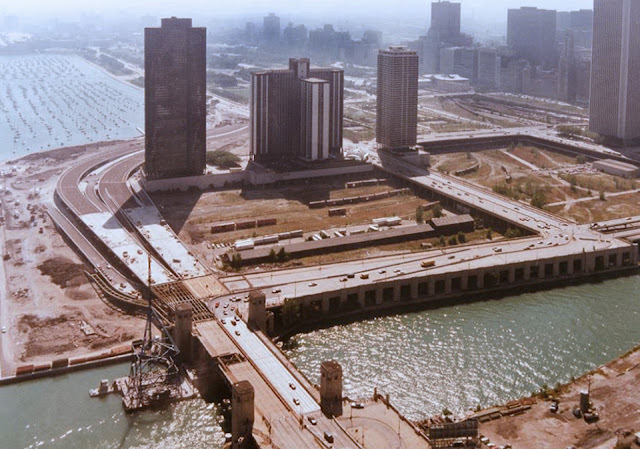 Note that the old "S" curve still exists as the new road is being constructed, and running east and west along Wacker Drive are strings of freight cars where today's Lake Shore East stands.